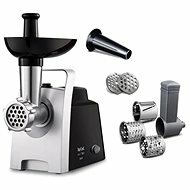 The Tefal HV8 NE6081 meat grinder has a maximum power input of 1800W and a meat grinding rate of up to 2.3kg/min, self-sharpening stainless blades and a reverse function. 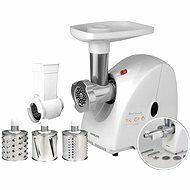 The mill has 3 stainless steel grilles with a diameter of 54mm and a width of 3mm, each of which has large openings for specific purposes: 3mm for breadcrumbs, 4.7mm for grinding meat and 7.5mm for homemade sausages. It also offers an extension for the production of biscuits, sausages and filled Kebbe meat bags. Easy and Effective Preparation - bolognese spaghetti, meat balls and salad with sliced ? ?cucumber and grated carrots has never been easier and faster! Grinding speed up to 2.3kg/min, self-sharpening stainless steel blade for long-lasting results. Easy storage - Easy to store accessories thanks to an integrated storage box. The large and well-stocked grinder is high-powered for easy food processing and has an exclusive metal design for attaching to the front of the instrument. Adjustable length of power cord. reverse operation, sausage stuffing, mletí Done! 3 mm, 4,7 mm, 7,5 mm Done! Reverse operation, Filling sausages Done! 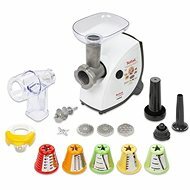 For shipping to other EU countries visit this page Tefal HV8 NE608138. Für Versand nach Deutschland, besuchen Sie bitte Tefal HV8 NE608138. Chcete doručit zboží do Česka? Prohlédněte si Tefal HV8 NE608138. Chcete doručiť tovar na Slovensko? Prezrite si Tefal HV8 NE608138. Für Versand nach Österreich, besuchen Sie bitte Tefal HV8 NE608138. Magyarországra történő kiszállításért tekintse meg ezt a termékoldalt: Tefal HV8 NE608138.